The Computer table of the future is here. Professional and aesthetic, these split-level Computer tables from Balt take any computer room or office to the next level of style and comfort. Each platform can be independently adjusted for truly ergonomic comfort. Built-in desk grommets keep tabletops free of wires, and the bolted CPU holder allows easy access to all technology. Laminate tabletops wipe down easily for hassle-free maintenance, and the contrasting colors look great in any environment. 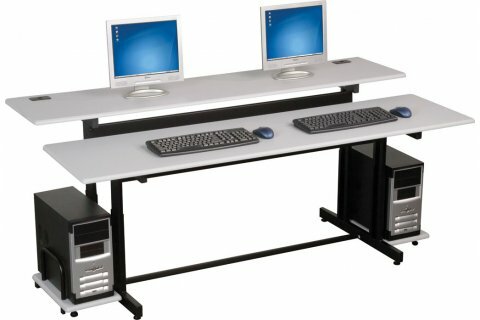 With computer tables like these, your students and employees might just be happy to stay overtime. Total Height Adjustability: Two independently adjustable platforms allow total control for optimum height and comfort while working. 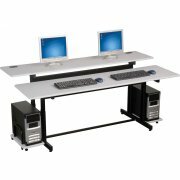 Both platforms adjust from 25.5" to 31.5"
Technology Management: Bolted, elevated CPU holder keeps technology within easy access and off the floor to facilitate cleaning activity. Note: CPU holders add 8.75" to each side of the table. Clutter-Free Workspace: Built-in desktop grommet keeps wires and cables neat and away from your workspace. Low-Maintenance: Laminate tabletops wipe down easily, and are stain and scratch resistant. Professional Style: Contrasting colors of black and light gray give this training table a striking, professional look. Optional Cable Management: Optional cable management system available to route all cables and wires.